Slovenia is situated on the sunny side of the Alps, in the heart of Europe. It is ideally positioned, and it’s and smallness enables the traveller to pay a visit across the border at any time and to sightsee the neighbouring countries. Travelling from Ljubljana, the capital of Slovenia, it takes you only 2 hours to sit in a famous Venetian Gondola, it takes you six hours to the fantastic Rome or magnificent Prague, and only four hours will do to get to Vienna Philharmonic Society or to enjoy an Italian shopping experience in Milan. Our friendly and experienced guides have received rave reviews from past clients, including some well-known people who prefer only the best. Our tours are conducted in a private car or luxury van, depending on group size, and they are specially designed to cover the areas you will most want to see. This tour is suggested as a 10-day “safari” trip for groups from couples up to a maximum of 8 people. The best time to visit Slovenia is from April to October. Flying in to Ljubljana Airport, where you will meet your guide, transfer to the hotel. Ljubljana the capital of Slovenija, known as Emona in the Roman Era, a meeting point of Roman, Germanic and Slavic nations. In the evening short walk through the old town centre along the river. Dinner in a typical Slovenian restaurant-gostilna. Accommodation in the 4-Star Grand Hotel Union or private 5-Star Villa Antique. A tour of Ljubljana with a local guide. The old Town lies between Castle Hill and the river, where we can admire Baroque architectural masterpiece by Jože Plečnik, the most famous architect working in Ljubljana and Vienna. 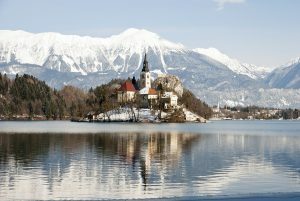 Central food market, the triple bridge, The castle and more… Our drive continues on to Bled with its emerald lake, picturesque church on an islet, a medieval castle clinging to a rocky cliff and some of the highest peaks of the Julian Alps and the Karavanke as backdrops. A boat trip on the lake and visiting the little island with it’s Church. Dinner in a typical Slovenian gostila and returning to Ljubljana. Accommodation will be in the 4-Star Grand Hotel Union or a private 5-Star Villa Antique. OPTIONAL: Sightseeing Ljubljana by bicycle, a boat tour on Ljubljanica river, or visiting Bohinj Lake. A trip southwest from Ljubljana to Goriška Brda for wine and tasting. We will visit Goče village extrodinary 300 years old completely restored as it was. Our drive continuous to Goriška Brda, home of the best Slovenian wines. While at the vineyards, we will taste their special prosciutto, have a “slow food” lunch and taste the wines. After lunch, the tour continues to the most beautiful city on earth, Venice. Transfer to the hotel by a private boat. Overnight in Venice at a 4 or 5-Star private villa. DAY 4 – Venice, the apartments and the fabulous Grand Canal After breakfast a sightseeing tour led by a local guide. 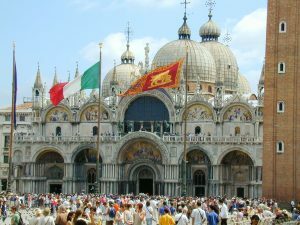 St Mark’s Square, the Basilica and the Doge’s Palace. St. Mark’s Square used to be the political and religious centre of the Republic of Venice; since ancient times it has been a place extraordinarily rich in historical and artistic value. We shall visit the basilica with its precious mosaics and the Ducal Palace with its well-known Bridge of Sighs, the Procuratie Palaces and the Napoleonic Wing, the Clock Tower, the Campanile and the Marciana National Library. Free afternoon to enjoy the moment of being in Venice, maybe a time to call your friends and make them envy you. Italian dinner. Overnight in Venice. 4 or 5-star private villa. Vienna, the glorious city first mentioned in 1137 as a city. Vienna is Austria’s primary city; with a population of about 1.7 million (2.1 million within the metropolitan area), it is by far the largest city in Austria as well as its cultural, economic and political center. It is the 10th largest city by population in the European Union. A city full of history and monuments.A tour with a local guide. Prater, Opera House, the Belvedere Palace, St. Stephan are just a few sights. Afternoon leisure and shopping or a relaxing bike ride along the Donau river. Dinner in a typical Austrian restaurant. Accommodation in 5-star hotel or private Villa. Rovinj at around 4.00pm. Rovinj was first mentioned in the 7th century. Now one of the most prestigious towns on the Croatian coast with a very friendly climate. Late in the afternoon a guided stroll through the old part of the town and followed by a local dinner. Accommodation in a 5-star private Villa. A short drive along the Istrian coast to Pula. A guided tour in Colosseum or Arena, which was built in the 1st century AD during the rule of Emperor Vespasian and was used for fights and battles of men and animals. A stroll in the old part of the town, a walk through the Hercules Gate and Arch of the Sergi. Time for shopping or swimming and drive back to Rovinj. Local dinner. Stay in Rovinj. DAY 9 – Piran, a typical Slovenian coastal town. A day for swimming. Sometime during the day a short drive (2h) to Piran, the birthplace of Guiseppe Tartini, a famous composer and violinist. 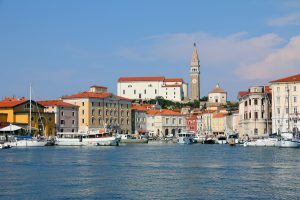 A guided sightseeing tour of the most beautiful city on the Adriatic sea. You will stroll through narrow streets with fascinating Venetian architecture and along the quay packed with boats. From this lovely town, you can see the entire Slovenian coast as well as the shores of Italy and Croatia. Accommodation in Piran. DAY 10- Shuttle to Ljubljana Airport (2h). Flight back to your next destination. This itinerary can be customised in a variety of ways to adapt to meet your needs and wishes. It can also be shortened to 7 days or extended to a full 2 weeks and mixed with other programs. Riding the slowest express train in the world – Depart from Venice train station and 8h later arrive in St. Moritz and Zermatt in the heart of the Swiss Alps about 3000m above the sea level. – 24h Chauffeur/guide service with a luxury Mercedes Benz sedan or van, depending on group size. Departure dates can be arranged to suit your needs from April through October. Our tours sell out fast, so contact us today, and we will work with you to plan a dream vacation!